1. Dry roast all the spices, cool down and grind to form a powder. Bay leaft and chakli may not be added in the powder. 2. Heat 1 tbsp of mustard oil in a kadai, saute potatoes and remove from kadai. Saute all the vegetables together. 3. 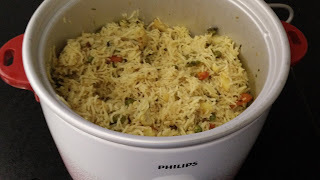 In a rice cooker, add rice, sauteed vegetables, spices powder, chakli, bay leaf along with all other ingredients. 4. Put the rice cooker and cook mode and once the mode changes to warm then hot steaming biryani is ready. 5. 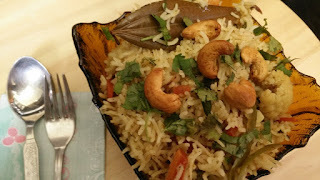 Garnish with fresh coriander and cashewnuts. Serve curd, papad along with biryani to have a wholesome meal.